As I had referenced in my last post, I wanted to talk about an interesting little thing called the “Glass Slipper Effect.” The original article was entitled, “Implicit romantic fantasies and women’s interest in personal power: A glass slipper effect?” by Rudman and Heppen (2003). Unfortunately I am unable to share a direct link with their work as it is the property of sage publications, but I can share my review of it with you! If we recall from the Angry Woman Study, failing to fit in with your social norm can lead to people having negative attitudes about you. We want to know where these views come from, and what impact these views have on future generations. Interestingly, Rudman and Heppen (2003) found that our romantic fantasies were strongly related to our work and education goals. The authors asked some pretty simple questions. If women have a tradition view of their male partner, will they have a more traditional work and education goal? These two ideas seem worlds apart, but if we suspect that gender identity is the guiding factor behind education goal, work goal, and relationship view, then perhaps they will all be impacted. The authors went through three versions of this study all looking at relatively similar information. So with the IAT, the first task required that the participant organize the cards so all the romantic descriptors are paired with the partner cards. Thus a card which said “super hero” would be paired with “boyfriend,” while the card “cousin” would be paired with the card “normal.” The second task required that they do the opposite. That is, they pair mundane description cards to the partner cards, and pair romantic cards to the non-partner cards. Now you compare the time it takes for a participant to do the partner-romantic pairing, versus the partner-non-romantic pairing. This will give you the IAT score. Why does the IAT work? Basically, if you get a higher score, it means you had a really easy time pairing your partner with romantic things. In contemporary social psychology, when a construct is activated, the information relevant to it is easily accessible. Thus it is easier to pair your partner with qualities you think they posses. Most participants did pair their partner with romantic terms faster than non-romantic terms as you may suspect. Why bother with all of this though? This allows researchers to implicitly measure someone’s beliefs. The participant in this study would have a hard time changing their response time in order to appear less biased towards their partner. It’s a great research method when coupled with other methods. That is to say, implicit measures by themselves can be bad, but when added to a study making explicit measures, they serve to enhance the study greatly. The authors also assessed the income level, education goals, and career goals using a survey. The survey listed a number of positions (CEO, manager, admin assistant, etc) and the participants would indicate in which jobs they were most interested. 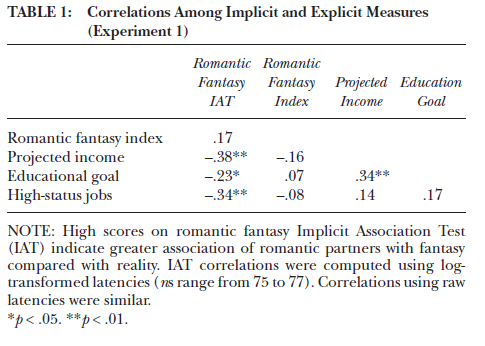 The authors suspected that people with stronger romantic fantasies would be interested in jobs that required less education, paid less, and had less prestige. Ok, enough about methods! Let’s talk about some results! So here we have a correlation table. Correlation values marked with * or ** are statistically significant (meaning they are the ones we should focus on). The authors found that the romantic fantasy IAT (that card sorting task) was a really fruitful measure. Female participants who scored higher on the romantic fantasy IAT would seek careers that offered less pay, they had lower required education, and they were interested in jobs of lower status. That is incredible isn’t it? If someone has stronger romantic views of their partner, they are more likely to spend less time in school, aim for a low status, lower paying job. These results were replicated in experiments two and three in this study, although the replications added males to the study to look for further effects and added more overall measures. However, the heart of the matter was found with the first study!!! The authors go on to talk about what this finding means. They suggest that allowing young women to be exposed to negative female role models is partially to blame for this effect. Imagine the classic princess stories brought to up by Disney. In most cases they are a non-exceptional woman who just happens to be attractive. They get placed in an awful situation, and then their prince comes to save them. The contemporary Disney princesses are actually less guilty of this. However, these stereotypes are being impressed on children at a very young age. A young girl is being told early on what a fulfilling life is like. One where a prince comes along, takes care of everything, and allows you to live a life free of worry. Clearly this is a sexist view of things, but it is prevalent in our culture nonetheless. How can we fight this? As parents, we should be very picky about what we allow our children to see. Imagine your child’s environment and view all negatives as toxic. Do not allow your child to live in a toxic environment. Negative female stereotypes pollute the next generation and it stifles the potential of our entire population. Allow me to say that again. By engaging in these stereotypes we are willingly allowing a large portion of our workforce to be less productive than they could potentially be. Allow me to clarify that just because a person does not want to have a high profile, high paying, high status job, it does not mean they are a problem. It is a problem when 50% of the population is being ushered towards this lifestyle. So looking back on all those times you may have thought feminists were overreacting about the portrayal of women in the media… it turns out they were definitely on to something. Up-keeping the gender stereotype only serves to waste an immeasurable amount of talent. This concludes my unit on stereotypes and discrimination. I have yet to select my next set of topics, but feel free to leave a comment about this article, or if you have suggestions about a future topic! Rudman, L. A. & Heppen, J. (2003). Implicit romantic fantasies and women’s interest in personal power: A glass slipper effect? Personality and Social Psychology Bulletin, 29, 1357-1370. By psychddouglas in Uncategorized on April 25, 2012 . This is a topic which seems painfully obvious, but only in retrospect. I enjoyed this read, and will recommend to others. What was the age range of the participants? I’m curious about how maybe more middle aged women who are career women would respond compared to teenage girls. Also, I would be interested to take it a step further and measure actual relationship satisfaction, both theirs and their partners. My thoughts being it would be likely that a relationship strained by unrealistic expectations on the part of the woman would lead to lower relationship satisfaction. But then again, maybe that would only be in the long term and in the short term they would have an increase in relationship satisfaction due to being blinded by their positive projections of their partner. What do you think? The majority of the participants were college age females. Women in the workplace who have different goals than younger women in college would likely have fewer of these implicit romantic fantasies the longer they are in this environment. I’d make this claim because of the correlation between romantic fantasy and prestige/power/wealth. Now we need to be careful, though. It’s hard to say if this would cause a change, as we know this is merely a correlation. These relationship views are supposed to be formed at a young age, according to the author, so they may be very difficult to alter later in life. However, I still believe that if you are in a competitive work environment for a long enough period of time, your attitude will probably change. As for satisfaction, it’s a tricky subject. Disillusionment of ones partner occurs typically after a three month period. The first three months of the any relationship are typically quick and we fail to see our partners faults. So if a relationship makes it past the three month mark, we will expect the relationship to last a while. The next markers are about 3, 7, and 11 years. This is because attachment, facilitated by the release of oxytocin (of course) should have allowed for a strong relationship to form, and these chemicals tend to dip down around these time periods. This why people can really get on each others nerves (negative hippocampus based explicit memories) but still have a strong attachment with each other (implicit memory). One part of our memory is telling us one thing (this person is a lazy, good-for-nothing slob!!!) while the other side of our memory really finds that the person to be overwhelmingly positive (due to chemical releases in the brain). So with that said, those unrealistic expectations may cause some turbulence at the three month marker. I think it would be an interesting investigation. Track people in new relationships and see how hard the three month disillusionment is. The less realistic the views, the harder the crash, but I have no supporting evidence to back up my assumption. As a counter point, it may be that people with unrealistic views could be more forgiving of their partners fault. It’s an interesting point, and I would love to know what would happen. If I find research out there that has found the answer, I will be sure to post it!